The North Fork River, also called the White River, located near Tecumseh and the Arkansas border is a big river with many big Brown and Rainbow’s. The White River also flows through Arkansas but I will try to keep the focus here on Missouri. The best fly-fishing water begins below Double Springs and continues seven miles to Patrick Bridge. There is good fishing upstream from here, but this is the blue ribbon section of the river. Some Record size fish have been pulled out of this river near Norfolk Lake. 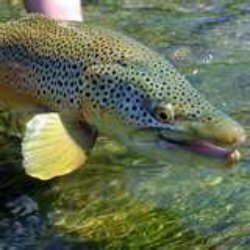 How does hooking into a 35 pound Brown trout sound to you? Although this is a great trout stream most of the fishing will need to be done by a boat. If you find yourself fishing any where near a dam you will want to pay close attention to the water flow. Since they produce electric power with the water they can turn it on at anytime. They will usually blast some horns to warn you that they are about to release water. Be sure to get out of the water as soon as possible, so as not to get swept away. The dry fly fishing is great on this river. There are nice hatches of Caddis, Mayflies, Stoneflies and Trico at varied times of the year. There are many flies that work well on this river including some of the following;Suphur, Midge, Shrimp, Wooly Bugger's and Scupins to name some. There is pretty good access to this river via county roads and various dirt roads. The best and easiest place to access the river is Blair Bridge at highway KK. The stretch between Blair Bridge and Kelly Ford is the best fly-fishing of the blue ribbon section. Below Patrick Bridge is where all the Brown trout are. So while the upper stretch is getting credit for being a great Rainbow stream, the lower stretch provides the large Brown population. This section of the river runs six miles and has good access at Blair Bridge and Patrick Bridge. The best stretch of this lower water is the first 3 miles to Althea Spring. Leave this North Fork River and go to the Missouri page. STREAM FISHING TIP. Water levels are very important. If there is any sudden increase or decrease in the water levels the fishing can change dramatically. Be sure to look at the most recent stream flows for any of the rivers you want to fish to see the recent levels. Click stream flow link below and choose some water.